We’ve spent many years installing thousands of dog fences in widely variable circumstances - in simple flat lawns, across lakes and streams, on mountainsides, secured to structures or bolted to large rocks…you name it. In our experience, 20AWG wire, which is included in most basic DIY kits, is seldom durable enough to last in many normal situations. Many trenching machines can’t handle such small wire, destroying it instead in the attempt. We would only recommend 20 gauge wire for indoor use, or possibly in very small garden or flowerbed loops which are independent of the main perimeter wire. 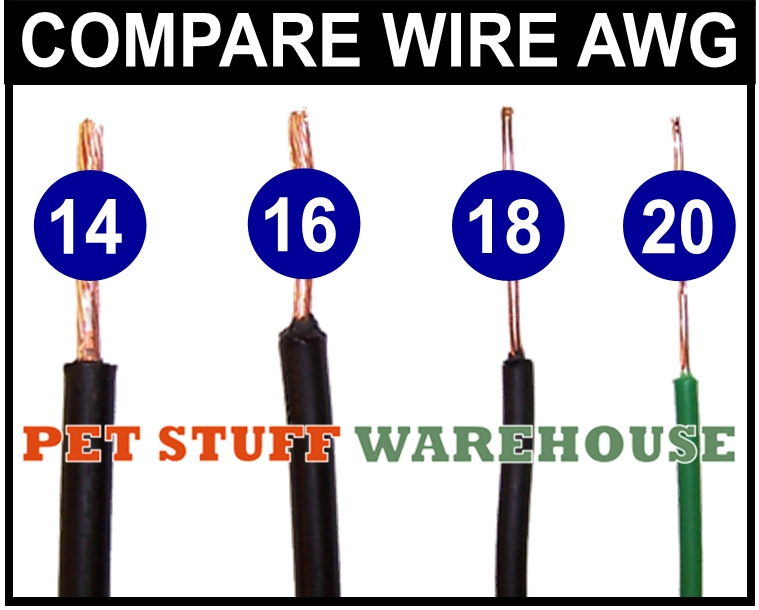 Even 18AWG wire should, in our opinion, only be used if you don’t expect more than 5 years of reliability - and plan to be careful not to damage it. Will 20AWG or 18AWG work? Sure they will. They will connect to any pet fence equipment and create the loop. The issue is not simple functionality, but lasting durability. At our Alabama dog fence dealership, we use 14AWG XHD wire with a .45mil PE jacket as a rule. We have found it to be the most durable wire on the market for most situations, and it saves our customers money in repairs. In appropriate circumstances we will use 16AWG HD wire, but we do not use 18AWG or 20AWG wire for permanent outdoor installations. We feel that the moderate extra expense spent on quality wire will save our customers many possible hours of frustration, not to mention more money, repairing and eventually replacing low quality wire. Invisible Fence Company, in several of its pet fence equipment manuals, specifies the use of 14AWG wire with a .45mil PE jacket¹. Dog Guard Out of Sight Fencing, in its manual, also recommends the use of underground-rated 14AWG copper wire². Terrain is the major factor in selecting the wire which will serve you best in normal installation situations. Rocks, roots, and regular foot or other traffic over the wire will make more durable wire your best choice. Most installations involve crossing a driveway at least once, and a point of entry into the transmitter’s location. For this and other reasons, professionals around the country normally use 16 gauge copper PE wire as a minimum and many prefer 14 gauge wire with a thick 0.45 mil PE jacket for its lasting durability. If you have a large, tough installation, you should probably seriously consider hiring a professional dog fence installer to do the job. If you want to do a job like that yourself, create your plan first, then purchase equipment and wire of good enough quality so you won’t have to re-do the job a few years later. We recommend using a maximum of 150 feet of twisted pair wire for any size installation. Twisted wire should be of the same Gauge as the perimeter boundary wire, or thicker. When two different wire gauges are combined, your transmitter will “see” only the smaller wire. Transmitters should be properly grounded to the electrical outlet using 16 AWG or larger wire unless you use a grounded Lightning & Surge Suppression Unit. American Wire Gauge (AWG) sizes may be determined by measuring the diameter of the conductor (the bare wire) with the insulation removed. Refer to the Wire gauge Diameter Table for dimensions. When choosing wire gauge, the distance the wire must run and installation conditions must be considered first. Refer to the Dog Fence Wire Gauge Selection Table for our recommendations. Note that for added durability, you can always use thicker wire (lower gauge number) than is recommended. Linear Low Density Polyethylene (LLDPE) insulated solid or stranded copper conductor is intended for direct burial. This type of wire is designed for use as a dog fence perimeter or locating wire in wet or dry locations. Heat and sunlight resistant extra tough LLDPE insulation is formulated to provide excellent oxidative stability, toughness, and abrasion resistance. It also provides superior environmental and thermal stress-cracking resistance. Why Shouldn’t I Just Buy Some Wire at the Hardware Store? Many DIY homeowners, as well as some dog fence installers – do just that. The wire sold at most hardware stores is known as THHN because of the wire coating, which is called Thermoplastic High Heat-resistant Nylon. Tracer Wire - also known as Locating Wire - is preferable for several reasons. Used mainly by Gas, Water, Fiber Optic, and Sanitation companies in the 1990s, it has grown in popularity among professional dog fence installers in the past decade. Unfortunately, a lot of dog fence contractors and DIY homeowners will still use THHN for this function, although you'll see it's a poor choice, as the following paragraphs will demonstrate. When wire is to be used underground or exposed outdoors, it must be durable, flexible, and well insulated against oxidation. Here's where THHN is problematic. THHN doesn't have the insulation necessary to hold up over time. Typical underground installations are expected to last up to 10 years. Nylon, the main covering of THHN, is very susceptible to water and moisture, causing breakdowns in the wiring under adverse conditions. Either under or above ground, outdoor exposure takes a toll on THHN, which starts to wear down and erode. UV exposure in direct sunlight is particularly damaging to the outer wire covering, hastening the pace of degradation. Over the course of several years (fewer years than you'd like), THHN wire will become more-or-less useless as small pockets of oxidation increase signal resistance – making your expensive dog fence transmitter work harder than it should. In all likelihood, THHN will need to be replaced once or even twice over the course of a typical dog's life. The solution? PE Dog Fence (Tracer) Wire. With 30 to 45 mils of Polyethylene, PE-jacketed Dog Fence Wire has all the flexibility of THHN, but with far better insulation and protection against underground conditions. Polyethylene offers a very strong insulation, often double or even triple that of THHN, so it can withstand even the toughest of underground conditions. When installed in underground or exposed outdoor installation, PE wire will last far longer than THHN. Just as important, dog fence owners will save hundreds of dollars much inconvenience because they won't have to replace PE-jacketed Dog Fence Wire as they likely will with THHN. The only real case for using THHN for direct burial (even thought it isn't rated for it) is that it's inexpensive. You might save a little money up front, but when you consider future costs to repair and replace it, long-term costs often end up skyrocketing. In addition, using PE-jacketed Dog Fence Wire is much more affordable than it once was. Even with all the added benefits, PE-jacketed Dog Fence Wire costs only a little more than THHN, with a huge upside in terms of increased insulation, heat-resistance, UV resistance, and durability. 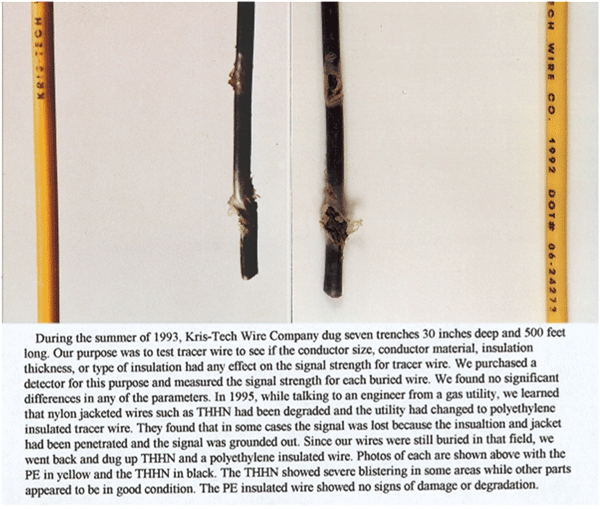 Wire manufacturer Kris Tech performed a real-world wire durability test in the early 1990s. After only two years, they dug up both the THHN and PE wires. The superiority of the PE wire is unmistakable; the following photograph and its caption tell the whole story.